You don't even have to boil the pasta! 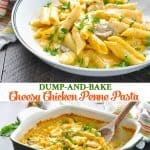 For an easy dinner with just 10 minutes of prep, stir together this Dump-and-Bake Chicken Penne Pasta Recipe and let the oven do the work! You don’t even have to boil the pasta! 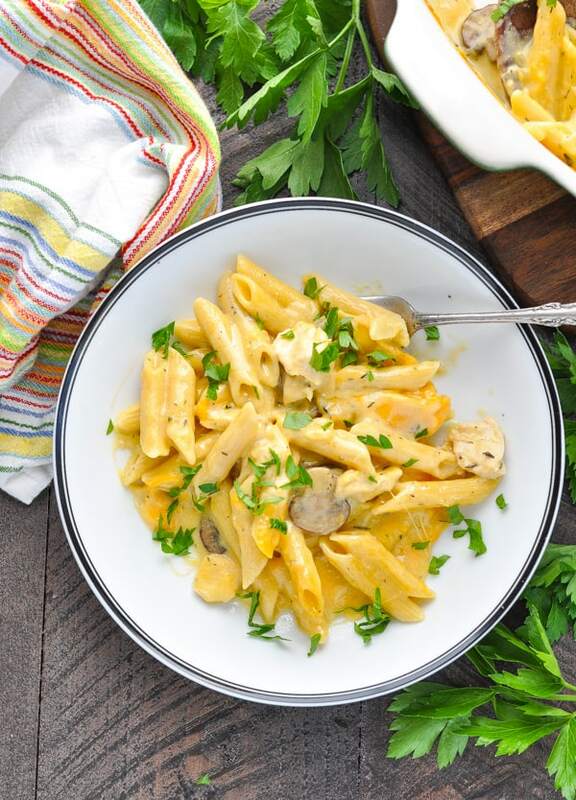 For an easy dinner with just 10 minutes of prep, stir together this Dump-and-Bake Chicken Penne Pasta Recipe and let the oven do the work. 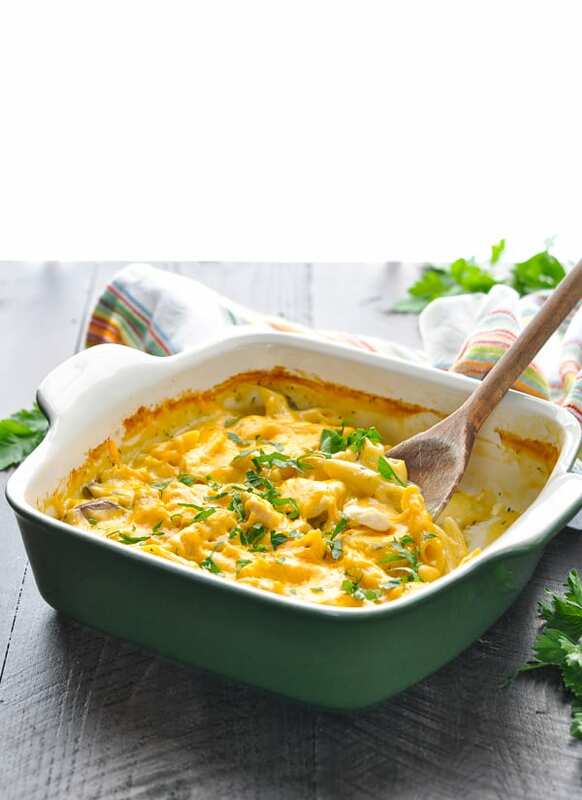 The cheesy baked casserole is a cozy, hearty and satisfying one dish meal that the whole family will love! 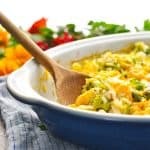 There’s nothing better than a warm casserole on a chilly evening; however, it can be a hassle to pre-cook the pasta, pre-cook the meat and vegetables, and pull together a sauce. 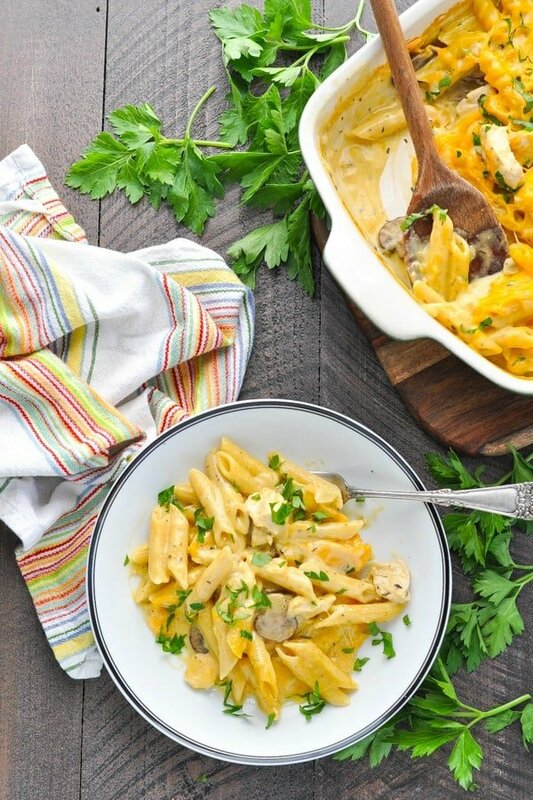 Instead, a dump-and-bake penne pasta recipe with chicken is the way to go! How do you make the BEST penne pasta? 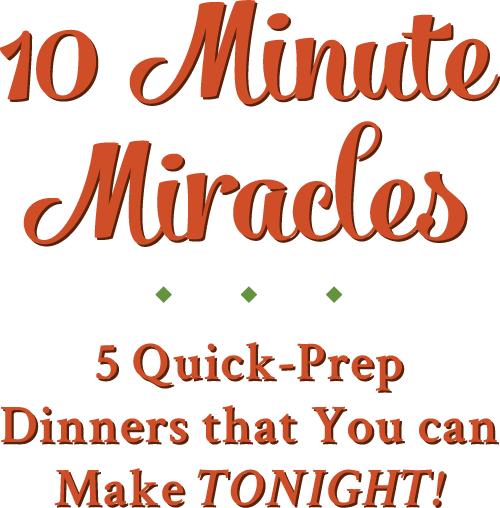 You literally just stir together the ingredients and pop the dish in the oven! It’s seriously that easy! 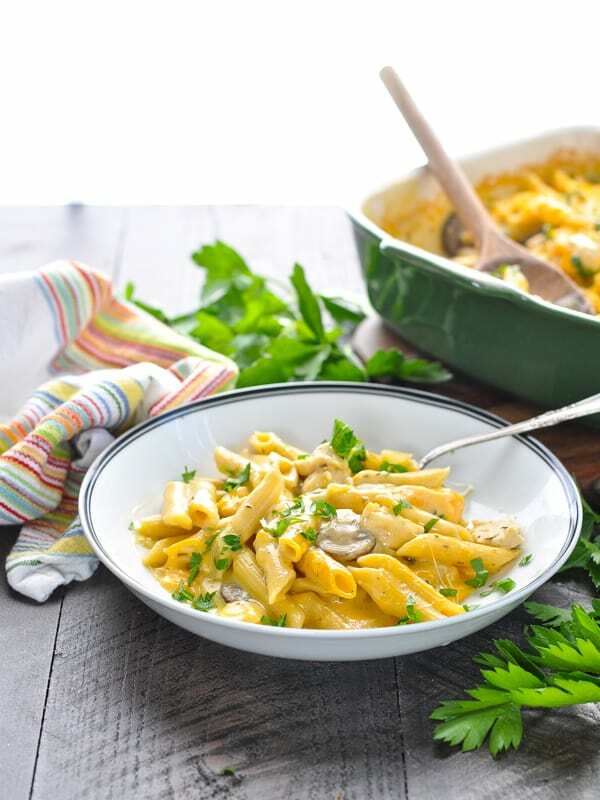 First, make the sauce for the creamy penne pasta recipe by whisking together a can of condensed cheddar cheese soup, milk, chicken broth, thyme, salt and pepper. Now it’s time to stir in the onion, uncooked chicken, sliced mushrooms, and uncooked penne pasta. Transfer the pasta mixture to an 8-inch square baking dish, cover with foil, and bake in a 425 degree F oven for 35 minutes. 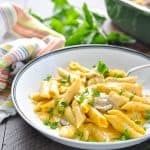 It looks like a lot of liquid at the beginning, but the pasta will absorb most of the liquid as it cooks, resulting in a thick, creamy baked penne pasta recipe! After 35 minutes, remove the dish from the oven, remove the cover, and stir in the sour cream. 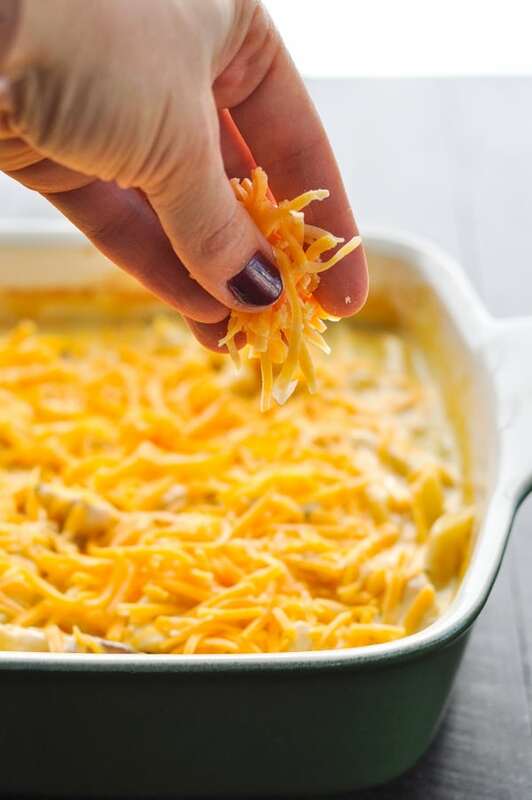 Sprinkle cheddar cheese on top, and then place the dish back in the oven (uncovered) for about 5-10 more minutes (or until the pasta is tender and the chicken is cooked through). 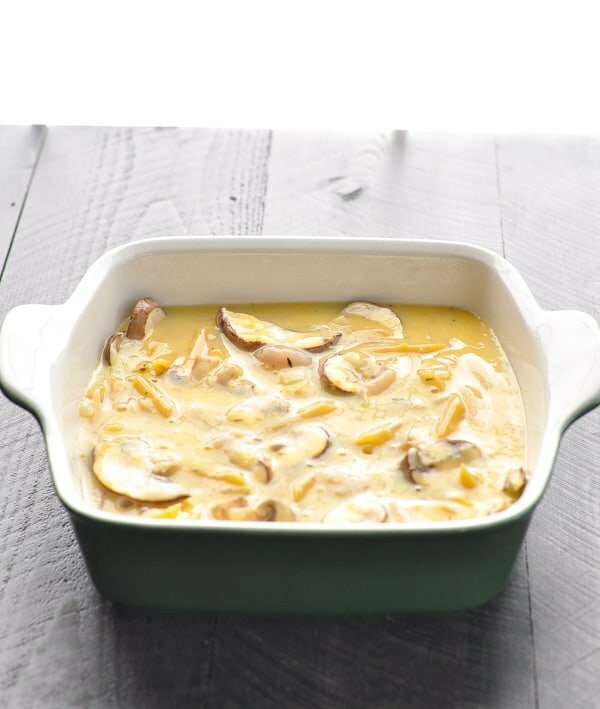 Allow the casserole to rest for about 5-10 more minutes before serving, which will give the cheesy, creamy sauce even more time to thicken. 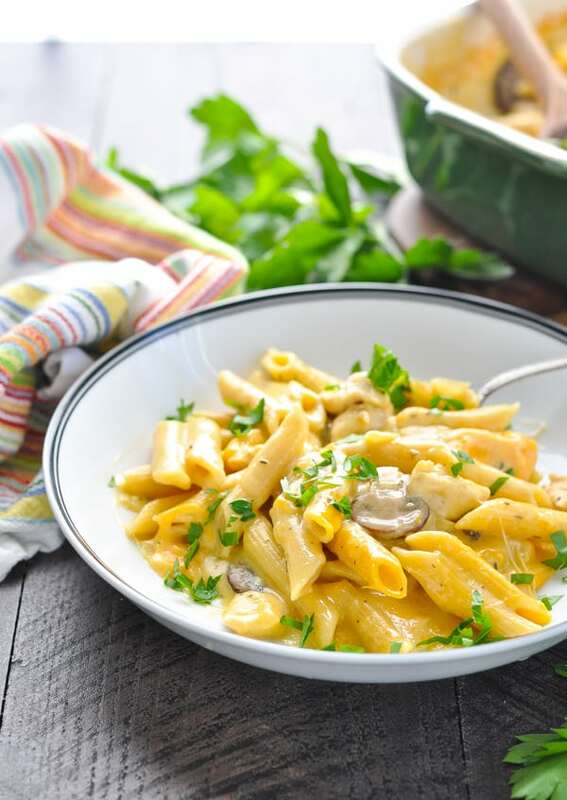 Keep this penne pasta recipe easy by using a package of sliced mushrooms (less prep work!) and pre-sliced chicken breast if you can find it in your grocery store. You can also use frozen pre-diced onion to avoid any chopping! 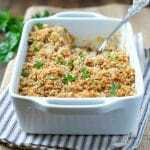 Make the penne pasta recipe vegetarian by omitting the chicken and substituting with a can of drained, rinsed beans or additional vegetables. 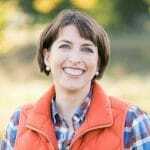 Nice options include peas (stir frozen peas in during the final 10 minutes of baking), frozen mixed vegetables, or steamed crisp-tender broccoli florets. 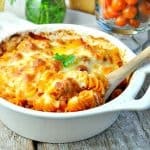 Make this penne pasta recipe with tuna or canned salmon in lieu of the chicken. 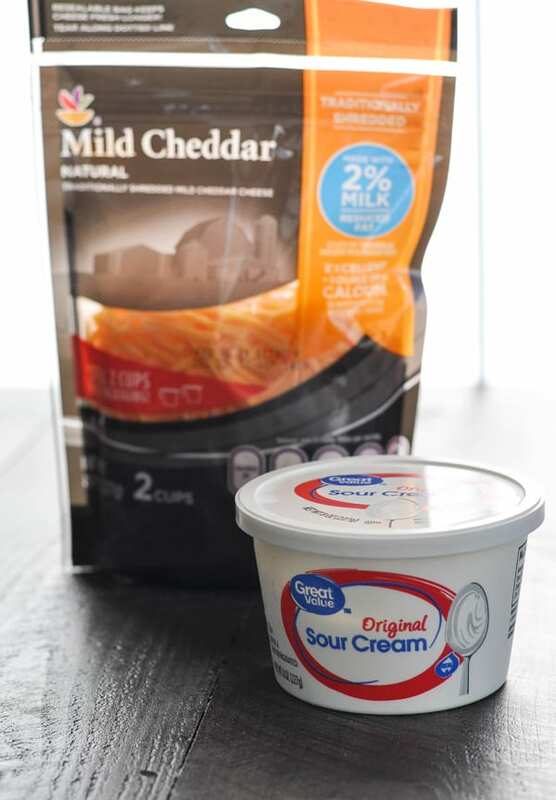 Can’t find the cheddar cheese soup? Substitute with condensed cream of mushroom soup instead! 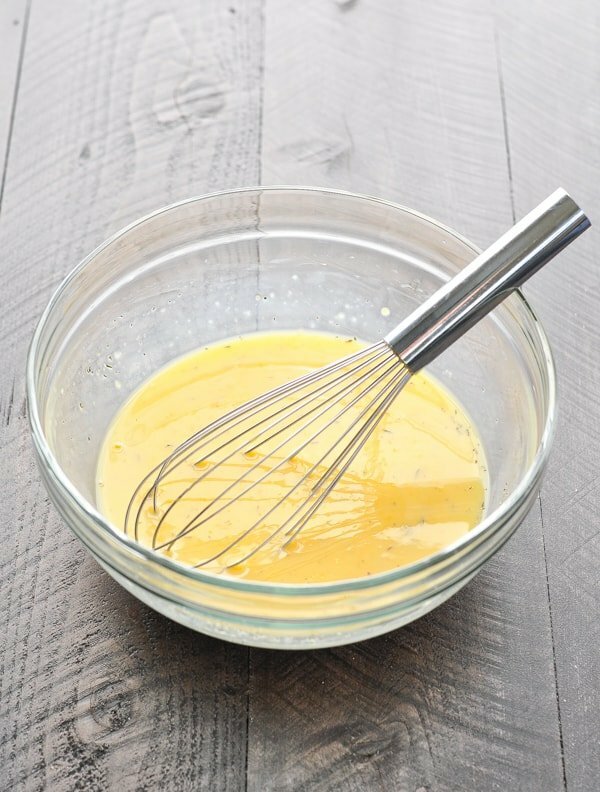 In a large bowl, whisk together condensed soup, milk, chicken broth, thyme, salt and pepper. 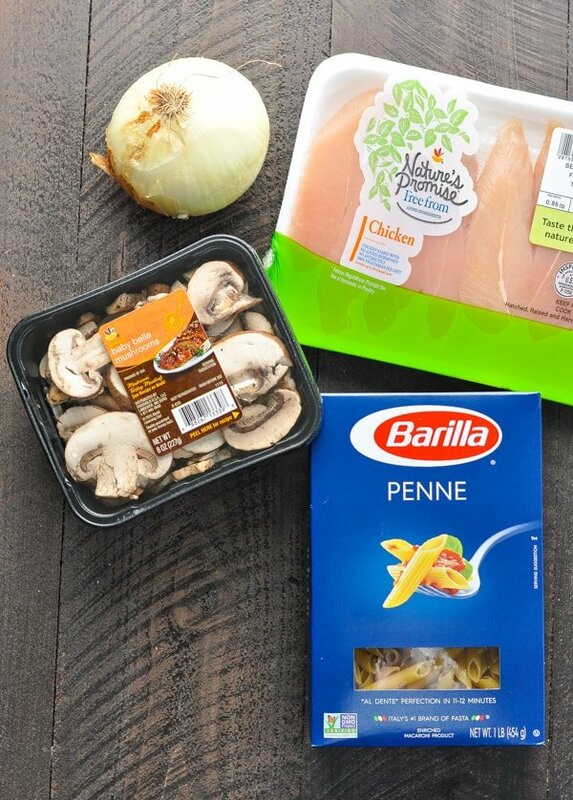 Stir in mushrooms, onion, raw chicken, and uncooked pasta. Transfer mixture to prepared baking dish. 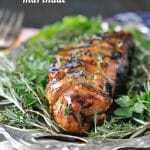 Cover tightly with foil and bake for 35 minutes. Remove foil and give everything a stir in the dish. Stir in sour cream, and sprinkle cheese over top. Return to the oven and bake, uncovered, for 5-10 more minutes, or until pasta is tender and chicken is cooked through. Let the dish stand for 5-10 minutes before serving. 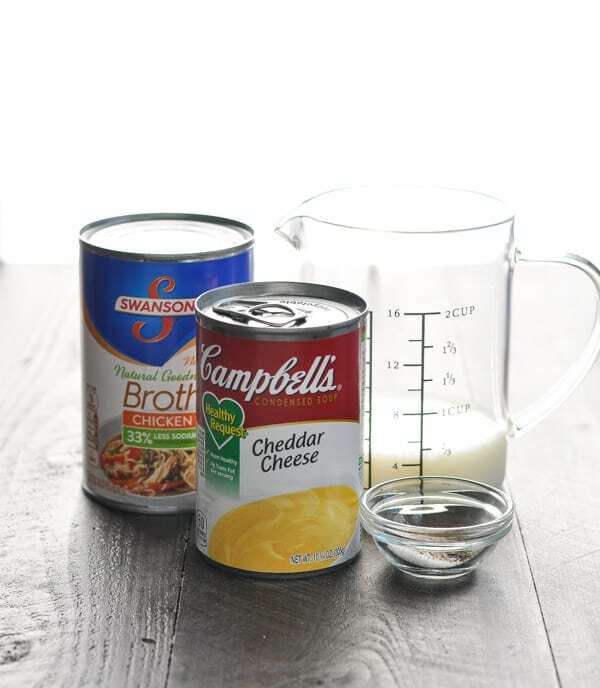 Can't find the cheddar cheese soup? Substitute with condensed cream of mushroom soup instead!